What Is eBay AutoCheck and What Does It Tell Me? 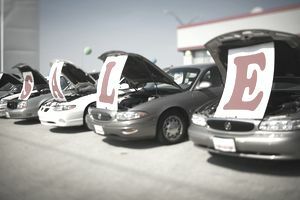 Shoppers that decide to turn to eBay in order to buy a vehicle will soon discover that eBay offers an AutoCheck report to buyers for many of the cars, trucks, and other vehicles listed on eBay. In some cases, the report is free (either paid for by eBay or by the vehicle seller), while in other cases as a vehicle shopper you're offered the chance to buy the report under the "Vehicle History Report" tab of the listing. But what is this report, how is it made, and what is it supposed to tell me? The basic idea behind AutoCheck (and similar services) is to prevent buyers from getting saddled with a vehicle that has an unusually (and potentially dangerous) history or that is embroiled in more legal or title trouble than may be desirable to the buyer. Whether a vehicle has been reported stolen, salvaged/discarded for salvage, or rebuilt. Whether the vehicle was deemed a lemon under various state "lemon laws" and returned. Whether the vehicle has been in a serious flood, storm, or other similar water damage situation. Whether the vehicle has been in serious accidents. Whether the vehicle's odometer is known to be inaccurate or not. Whether the vehicle has been used as a rental or corporate fleet vehicle, with all that this entails. Whether the vehicle has been involved in police or some types of heavy commercial use. Whether the vehicle was abandoned or forfeited by an owner. Whether there are any outstanding liens against the vehicle. Whether a vehicle title is likely to be available and issue-free. Whether the seller is an honest seller or anything about the seller's eBay feedback. What kind of customer service experience the seller is likely to provide. Whether or not the vehicle is likely to need parts or repairs after you purchase it (though eBay's vehicle purchase protection program may cover these in some instances). The cosmetic condition of the vehicle. What is likely to be involved in closing the vehicle purchase/sale transaction. What is likely to be involved in registering and licensing the vehicle and bringing it into legal operating status as your own. For this reason, it remains tremendously important to do all of the other kinds of due diligence that are important for a successful and satisfactory vehicle purchase, including watching for many of the red flags that can pop up from time to time in eBay Motors listings. Common sense should tell you that while the information on AutoCheck is useful, it's not going to be complete or comprehensive in all cases. You should rely exclusively on AutoCheck to make your decision for these reasons and for the reasons given above. The AutoCheck score can be especially useful or especially deceptive, depending on your understanding of what it means. The AutoCheck score considers lots of metrics about the vehicle such as known mileage, number of owners, age, and some of the factors detailed in the report. But the important thing to understand about the score is that it is is a relative score; it compares the vehicle you're actually looking at against other vehicles of the same make and model. A high AutoCheck score doesn't, therefore, mean a "good vehicle" but rather a "better vehicle than most others of the same make and model," while a bad score merely indicates the opposite—the car may be older, have higher mileage, a few more issues, and so on. Most critically, the AutoCheck score does not factor in price. A car with a very high score can still be a less-than-stellar deal if you pay too much for it, while a car with a relatively unimpressive score can be a great deal if you get it for a song. For this reason, you should use the AutoCheck score as one more data point in making your decision about whether to bid and how much to bid—not as the deciding factor to win at any cost.